It’s been awhile since Mix Master Miriam has made an appearance. It’s not for lack of baking – although there are still a few items on my “to-bake” list, including chocolate cake and home made bread. But there has been a lot of pancake making. It turns out, I’m pretty handy with a pancake flipper and I make the best buttermilk pancakes this side of the Mississississsissippi. Or at least that’s what I like to think. Admittedly the first couple of times I made these pancakes, I burnt them (shame) – but I blame it on the finnicky stove that didn’t have a clear “pancake” setting on the dial. One of the great things about these pancakes is that they are unbelievably fluffy. As in an inch high fluffy. Or maybe 3/4 inch. But they are FLUFFY. 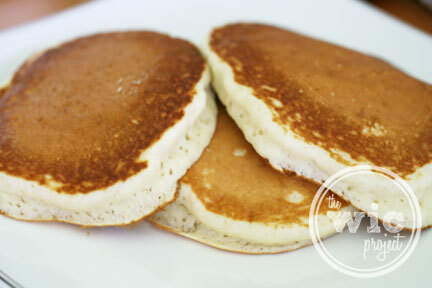 They have that great delicate pancake texture and soak up butter and syrup like a sponge. They’re awesome. My trick? Beaten egg whites. Most recipes tell you to add an egg, but the trick is to separate the egg. Add the yolk as usual, but use a beater (such as my awesome KitchenAid mixer) to beat those egg whites to nice foamy white peaks. Trust me when I tell you that using a mixer will make your arm very, very happy. It’s a difference between a few seconds of beating with the mixer and minutes of beating with your arm. Not a hard decision. Once you have soft, foamy peaks in your egg whites, carefully fold them into your batter. The other thing I think I do differently is that I don’t use any oil or cooking spray in the pan. I use a non-stick pan and keep the temperature set at medium low. This gives my pancakes a great brown color while cooking them through and through. Combine milk and vinegar and set aside for a few minutes while you make the rest of the batter. Combine flour, sugar, baking powder, baking soda, salt, and a dash of cinnamon into a mixing bowl. 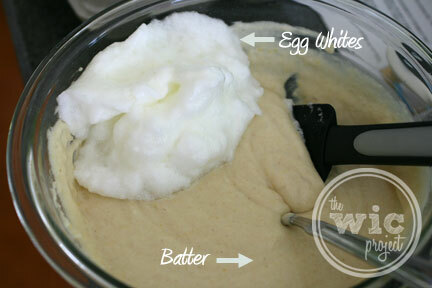 Separate the egg and beat the egg whites until they form soft, foamy peaks. In a separate bowl, whisk together the soured milk, melted butter, and the egg yolk. Slowly add the dry mixture to the wet mixture, whisking until there are no lumps. Carefully fold in the egg whites. Use a spatula – not a whisk as you want to keep as many bubbles as possible. Heat a non-stick skillet over medium-low heat. The skillet is ready when you sprinkle a few water droplets on it and they sizzle. Spoon or pour out 1/4 cup of batter onto the skillet and cook on one side until bubbles appear (but don’t pop) on the surface. Once the bubbles appear, flip the pancake over and cook until it’s a nice golden brown on the bottom. Top with melted butter, syrup, or your favorite pancake topping & serve. This recipe is modified from a www.allrecipes.com recipe submitted by kris. I hope you enjoy these pancakes if you bake them up! Do you have any special pancake tricks? I used to be able to make enough for leftovers, but my older boys have too much of an appetite now and can put them away. These look delish. We had pancakes for dinner on Sunday. Looking good! You should come link this up to my What’s Cooking Wednesday linky! 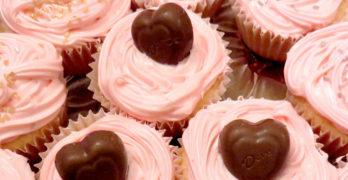 I just made them again a couple of days ago but added a touch of vanilla extract. SO GOOD! I’ve always wondered why my pancakes were not big and fluffy like IHOPS; thanks for the great recipe – can’t wait to make these for my family.